"Mystery troughs near Harrow, for they are certainly not those at Bushey! This looks like an error by LPC, and the correct location needs to be confirmed." This view, I think, is of an Up train on Whitmore troughs taken about 1900, and the photographer may well have been P.W. Pilcher who was known to frequent this location. The location is Whitmore troughs, train running on the up fast line. The train is the Liverpool-London TPO, which left Liverpool at 12.00 noon and arrived Euston at 5/00. The TPO (second vehicle) is a 32ft 0in WCJS carriage (no. 185, 188,189 or 211) which worked the 7.15 Euston-Aberdeen, 5/40 Aberdeen-Wigan, then empty to Liverpool, and finally 12.00 Liverpool-Euston. The first vehicle is 30ft 1in Parcel Sorting Van, still fitted with side gangways. The third is a 30ft 1in five-compartment Parcel Van, and the fourth looks like another six-wheel van. The rest of the train is indistinct, but is probably 50ft 0in corridor stock. The absence of a centre lamp socket on the engine indicates a date pre-1903, so most likely 1900-2. Having just seen David and Phillip's comment and bow to their superior knowledge (although I still think it could have been Castlethorpe, and it seems more likely the publisher would have confused that location with Bushey, as the next set of troughs north on the main line, rather than Whitmore which is a long way from Harrow!). For the avoidance of any doubt, and for the benefit of generations yet unborn, the location is without any doubt Whitmore, not Castlethorpe. The photographer is almost certainly P.W.Pilcher and I am going to conjecture that the date is August 8th 1901. 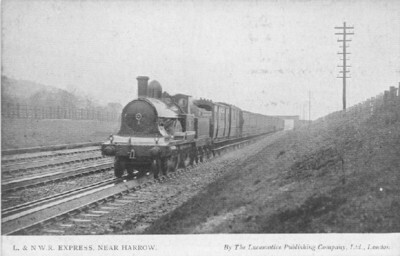 See the LNWRS Publication The Railway Photographs of P.W.Pilcher, plates 138 and 141, taken at the same spot probably on the same day. Having once confused Castlethorpe for Whitmore myself in a caption in a book (and earned a "tut, tut, Mr Talbot" phone call from a well known LNWR enthusiast, but only after he had graciously admitted he himself makes mistakes in his own work on the LNWR), I fully sympathise with Lynda and have learnt the hard way that there are three general points which help to distinguish the two places in photographs. Firstly, at Castlethorpe the line is slightly curved; at Whitmore it is straight, though there is a curve through the station. Secondly, at Castlethorpe the fast lines are on the down side, the slow lines on the up; at Whitmore it is the opposite way round, fast lines on the up side, slow lines on the down. So although in Mystery 92 the train might appear to be a northbound express on the down fast at Castlethorpe, it cannot be, as the line would be slightly curved and in the photograph it is straight. Thirdly, at both places there are overbridges: but at Castlethorpe it is just a footbridge with lattice sides; at Whitmore it is the standard type of Crewe bridge found all over the LNWR. As a general point, just to make Mystery 92 even more mysterious, the cutting side on the far side of the tracks looks like a wall on my computer screen. Perhaps others have had the same impression. It took me some time to realise it is actually a grassy bank. As Philip says, The Railway Photographs of P. W. Pilcher by David Patrick is a great help in identifying the location of the photograph and determining its details. Plates 138 and 141, however, are not strictly "taken at the same spot" but from the opposite side of the line and from a higher viewpoint (the cutting side is higher on the down side). The photograph in the book most closely "taken at the same spot" is plate 142 - in both pictures the signals by the overbridge in the distance can just be made out. These signals can be seen clearly in plates 146 and 153. Plate 142 seems to have been taken at a later date, since it shows, outlined against the spray from beneath the tender of the leading engine, a line of posts which are not visible in Mystery 92 but which can be seen in other photographs, notably plate 143. So this supports the idea that the date is earlier and Philip's guess that the date is 1901. On my computer screen the background is so indistinct that it is difficult to make out the four separate tracks. But is that, on the opposite side of the line, a prefabricated length of trough ready to be put into place, as in plate 144? Both pictures also show the ground rising beyond the line on the west side, where now, at the top of the slope, a number of fine houses have been built. Doubtless they have splendid views of the line and the country to the east, but how many of their occupants realise what dramatic scenes once took place on the line in front of their windows? A reproduction of this photograph is captioned "The up Irish Mail at Whitmore Troughs in 1900..." in Railway Memories by Rixon Bucknall and Dr T.F. Budden. This is a book of Dr Budden's photographs, taken from 1889 onwards, which was published in 1947. The date could be a year earlier as Dr. Budden was certainly at Whitmore on April 27th 1900 when he captured a Royal outing. The engine, 1903 Iron Duke, has the tender shelter for the man watching the train. Whilst agreeing with most of what has already been posted, another distinguishing feature of Castlethorpe troughs is that along side of the tracks can usually be seen a substanial brick built culvert. This can be seen in many of the Leslie Thompson collection of photographs and so far as I know, this feature was unique to those troughs, others merely having longitudinal sleepers placed beside the tracks, whether this was because there were problems of drainage and subsequential track problems, I have no idea. The train is very definitely not the Irish Mail but as I say is the 12.00 noon Liverpool-London TPO. As this fact somewhat undermines the credibility of the caption mentioned by Harry Jack, I still think that the photographer is almost certainly P.W. Pilcher and that the date is August 8th 1901. I did not intend "the same spot" to be taken literally to mean "while standing on the same blade of grass". Pilcher would naturally have moved his camera round a bit to get different views. I don't know what is meant by a "tender shelter for the man watching the train - about 40 years too late I would have thought, but the thing with a curved top behind the tender is the Lansdowne (side) gangway with which these Parcels Vans were originally fitted. They were removed circa 1901-2 and replaced by the normal centre version. In parentheses - the van is an early example of D.419 built in 1890-1 without torpedo ventilators. Later examples built in 1895 had torpedo vents from new, but the early ones were never retro-fitted. Quite a few of these D.419 vans were altered to Fish Vans in 1903-4, and others became Pigeon Vans in 1915. These are two pages from Railway Memories by Rixon Bucknall & Dr Tice F. Budden (1947), subtitled Two Hundred and Four Photographs by Doctor Budden. From the weather and that replacement trough on the left of the tracks in both photographs, and in Plate 144 in the Pilcher book, it looks as if all three could have been taken on the same wet day. Budden and Pilcher must have known each other; they were both at Cambridge University at the same time and shared the then unusual hobby of train photography. Perhaps they went to Whitmore together, maybe to see the Royal Train pass? My assertion in my earlier posting that the photographer was P.W. Pilcher led me to look further into that point. Whilst Pilcher could well have exchanged prints with the good Doctor as well as with other railway photographers of the day and the good Doctor could have published it under his name, I do not think that is the case. I have a copy of the print in question and it was printed by the LGRP Co who to my knowledge did not publish any views that we know were taken by PWP. These were published by the LPC. On the other hand LGRP has published masses of Dr Budden's photographs. On balance therefore, I feel my first intuitive guess was wrong and that what we see is indeed a Budden print. As regards the shelter on the rear of the tender, there is a clear view of this feature on Marchioness of Stafford on Royal train duty in the late 1880s or early 1890s and which in my opinion, is repeated in the print to which Philip refers. The shelter seems to be higher than the vehicle he supposes it is attached to, a most unlikely design feature I would think, if his assertion is correct. HM Queen Victoria was most set in her ways, and the probable knowledge amongst her advisors of the braking arrangements, or lack of them during most of her reign, on the LNWR, led to a 'belt and braces' attitude, in case the Webb-Clarke chain brake came to grief. The result was a lookout man posted on the rear of the tender on all LNW Royals up to the end of her reign. Other railways had, as you say abandoned this arrangement many years before. I have an excellent print of her visit up to London on the occasion of her Diamond Jubilee in 1897 behind a Dean single and there is no sign of this feature. Say what you like about the GWR, they at least had decent brakes, having started as early as 1876 to fit automatic vacuum brakes to passenger stock. A very happy Christmas to all our readers. The photo may or may not be by Pilcher/Budden, but absolutely no way is this a Royal train. I doubt if Her Majesty would have agreed to a parcels van and a Post Office being attached to her train! One more time - the train is the 12.00 noon Liverpool to London express. If a Royal train did pass earlier/later on this day I find it surprising that individuals would have been permitted to roam around the trackside unescorted or at all, even in those more relaxed days. And how did they know that a Royal train was scheduled to pass? In my time with BR the notices concerning the coded 'Grove' and 'Deepdene' trains were regarded as highly confidential, and I have no doubt that an employee who revealed this information would have been subject to serious disciplinary action. Unless it can be shown that Pilcher/Budden had friends in pretty high places, I find this idea of seeking to take photos of the Royal train hard to swallow. Did they in fact obtain pictures of a Royal train? References to the Webb chain brake are not understood - this was long obsolete in 1901. The automatic vacuum brake system had been in use throughout the LNWR since 1888. "The result was a lookout man posted on the rear of the tender on all LNW Royals up to the end of her reign." What is your authority for this statement? "The shelter seems to be higher than the vehicle he supposes it is attached to......" Does it? I do not see that. Once more, it is not some sort of shelter attached to the tender - it is the Lansdowne side corridor gangway on the Parcel Van. There seems to be some confusion here. Mystery Photo no. 92, allegedly the Irish Mail, but which Philip says is really the 12.00 from Liverpool, is on p23 of the book Railway Memories. The Royal Train, clearly showing the shelter for the look-out man on the tender, is on p22. Around 1948, as a schoolboy I went with a pal to an isolated spot, the lineside at Dixon Fold on the ex-L&YR between Manchester and Bolton, to see the Royal Train. We certainly knew when it would pass (can't remember how we knew; I don't think it was a secret), but we saw it, and the King and Queen inside. No-one else was around, nobody challenged us. Had either of us possessed a camera we could have snapped it. The big disappointment was the engine: it was very clean, with four white headlamps, but was only a boring Black 5. I think Philip may have the wrong end of the stick. I agree the view (no. 92) is probably what you refer to as an Up Liverpool train. The question of lookout shelters is viewable in Harry Jack's last but one message. Go to this and click on the first four words in red, 'These are two pages', and you will find the photograph we are referring to. I think you will agree this is a view of the Royal train in 1900 and the lookout shelter is quite clearly visible. There are many views of royal trains both in Victoria's reign and subsequently where crowds are visible by the lineside and at stations. To keep Royal visits secret would be almost impossible as every signalbox and stationmaster en-route needed to know the details and everybody on the system knew what 'Deepdene' and 'Grove' were codes for. Police, local authorities and those organisations being visited would all be privy to the details and they would leak out. True, the railway authorities tried to keep details secure, but as a lad, I well remember Bill Allen (past president of the society) and who worked at Rolls-Royce, not the railway timing offices, would tell my father and myself to meet him at Crewe station at a given time and we would see 'something special'. He was always right. His neighbour was the Line Manager's (Crewe) chief traffic inspector for the LMR (Western Division) and who travelled on every royal train that crossed that patch. So much for security. Yes, I agree that the two photos may well have been taken on the same day. Curious that the Royal Train is travelling on the up slow line. Or did Victoria not wish to exceed 40mph or whatever? Two small points - at that date the communication cord was still the Harrison cord system, by no means entirely reliable. Perhaps this is why the LNWR felt it necessary to provide a watchman in the rear-facing shelter, although I doubt if from that position he would have been able to see any gestures or arms waving from the side windows of the carriages. And would not there have also been a guard riding in the leading brake van? As you say, so much for security. I doubt if the movements of Royalty are advertised in advance today. More likely to be Castlethorpe than Whitmore as there is no bridge by the Whitmore troughs (circa 1942). The bridge over the north end of Whitmore troughs carried a lane from Madeley Park Farm and is shown on OS maps surveyed in 1949. There is a fine photograph of this bridge, taken in 1877, reproduced on an official L&NWR postcard (1904), in Richard Foster's article on water troughs in the British Railway Journal's special London & Birmingham edition (1989), in Ted Talbot's Railways in and around Stafford (1994) and in several other books and articles. One more time - for the avoidance of any doubt, and for the benefit of generations yet unborn, the location is without any doubt Whitmore, not Castlethorpe. As I see it, there are two main purposes to this Mystery Photo feature, both valuable: first, to help identify details of photographs, so as to add to the pool of knowledge about the LNWR; second to cater for people such as Lynda - let us hope there are many more like her - who look at the Webb site in search of interest and information on the LNWR but perhaps rarely make contributions. For both these purposes, it is important to explain things clearly, which is why I pointed out that Pilcher Plate 142 was taken in almost the same spot as Mystery 92, as well as showing two additional relevant features. As for the Royal Train, many years ago I included this in LNWR Miscellany Vol Two, where it is Plate 112. The picture was taken on April 27th 1900, when Queen Victoria was returning from Holyhead after her last visit to Ireland. When preparing the book, I discussed the photograph with Philip (he kindly gave me a lot of information on carriages) and I remember discussing the look-out shelter with him. Now he says: "I don't know what is meant by a 'tender shelter for the man watching the train' - about 40 years too late I would have thought". Philip's statement that Mystery 92 shows the 12noon from Liverpool may well be true. But simply repeating that statement does not make it any more true or untrue, and certainly no more convincing. Dr Budden was an experienced photographer and had spent many hours beside the LNWR main line. He had obviously gone to Whitmore to photograph the Royal Train and would have known what trains were due from the timetable. He would have seen them all many times before and can be expected to have identified them correctly. Of course, everyone makes mistakes, even Dr Budden. But what evidence is there for the train not being the Irish Mail? In fairness to Philip, he does explain in his first posting why he believes the train to be the 12noon from Liverpool; namely the formation of the train and the identification of a vehicle type that worked the relevant circuit. Of course the only way to prove a negative is by proving an alternative positive. Philip has indeed attempted to do this has he not? Please find here a photo, taken by myself, at Whitmore troughs. The train is on the Up Slow with electrification gantries in place. Pre-fitting colour light distants at Whitmore, the distants were on the photographer's side of the bridge in the background. After colour lights they were on the approach side of the bridge.